Marks & Spencer PLC is a retailer of clothing, luxury food, wine, homeware items and other products from its chain of stores around the UK. 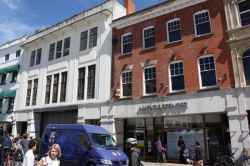 Based in Market Hill, Cambridge, Marks & Spencer is a department store. Marks & Spencer is in Market Hill Cambridge. You can view a list of neighbouring businesses by going to the Market Hill page. Note: the pin is positioned at the postcode centre, and may not correspond with the precise location of 6 Market Hill.